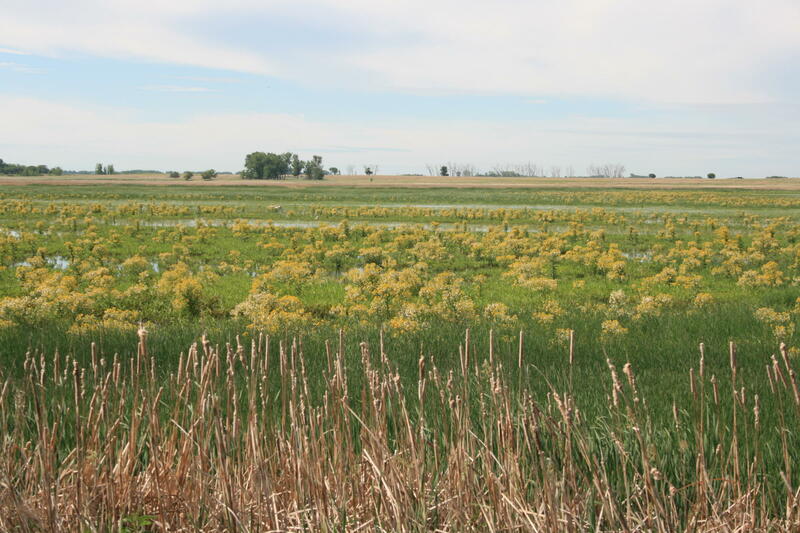 Some of you have no doubt noticed some large patches of yellow flowering plants around the margins of some cattail sloughs and similar wet habitats this summer. That is swamp ragwort, also known as marsh ragwort, northern swamp groundsel, marsh fleabane, or, get this, mastodon flower. It is a member of the aster family and is known to botanists as Senecio congestus, and more recently Tephroseris palustris. Swamp ragwort is an annual or biennial with weak and hollow stems. It grows to between 1-3 feet tall and produces several branches of “congested” yellow flower heads. The leaves are alternate, rough and hairy, with the lower leaves often narrow with toothed margins. Those on the flowering stems are generally wider with entire margins. 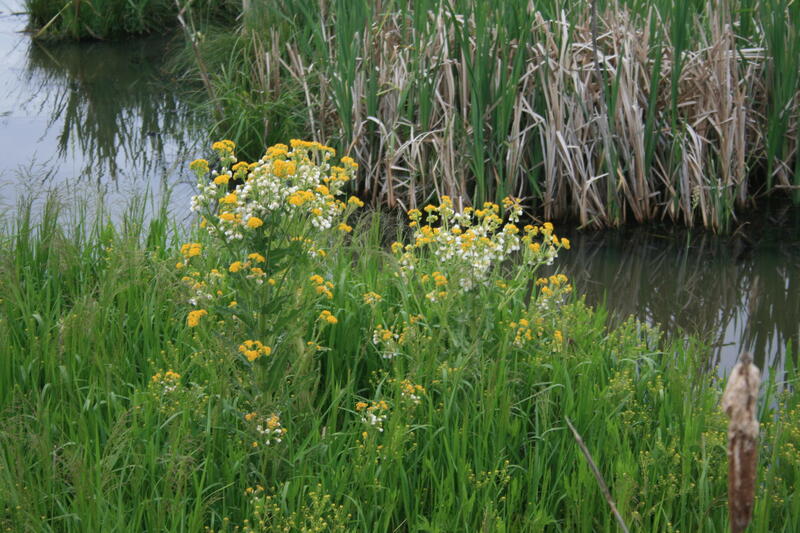 Swamp ragwort’s native range is the colder northern regions of North America and Eurasia. Here in North America is ranges over most of Canada and Alaska, plus the Dakotas, Minnesota, Iowa, Wisconsin, and Michigan. Here in North Dakota it may be found north and east of the Missouri River where it occupies shorelines, shallow wetlands, the margins of wetlands, mudflats, and similar habitats. It seems to be quite episodic, perhaps more frequently observed when water levels are slowly dropping and exposing new wet substrates. Some of you might be surprised to learn that this species is a polyploid. As the name implies, polyploids have several sets of chromosomes. In this species it may be 3 or 4 sets. We generally think a species has two sets of chromosomes, one set inherited from each parent. But polyploidy is actually quite common in plants. It might be a bit late to collect the plant for your culinary exploits. But the young leaves and flowering stems of swamp ragwort are reportedly edible. They can be eaten raw, such as in a salad, or cooked and eaten as a potherb. Some people even make a type of sauerkraut from the plant.